With Christmas fast approaching, we look for fun family things to do and I was delighted to stumble across the Leamington Lantern Parade last week. Apparently this event to "Light Up Leamington" has been running for a five years, but living in Coventry we had never heard of it. I checked out the link, expecting a few people wandering around with tea lights in jars, only to find it was a proper Christmas paper lantern parade. Just look at some of the pictures from previous events to see how fabulous it is (linky). Dave agreed it looked fun, but with the short notice we weren't sure if we'd be going as 'lanterneers' or spectators. Determined to have a go, I gave the parade organisers a call on Thursday to see if they had any lantern kits left, which they did. 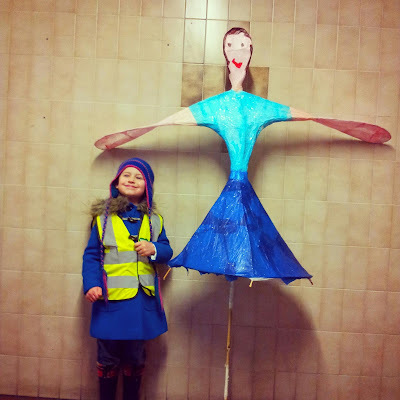 On Friday, M and I set off to find the organisers office and buy some bits for creating our own fantastic lantern. 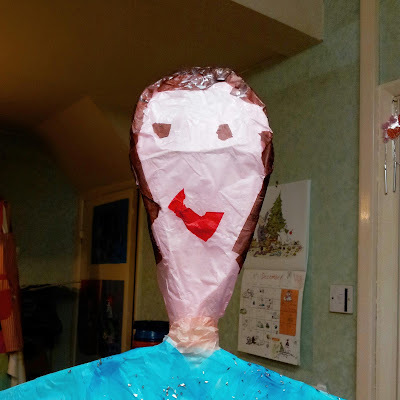 A lantern making kit turned out to be a selection of coloured tissue paper (which I supplemented from our craft supplies), wet strength white tissue, some willow withies, masking tape and a torch. 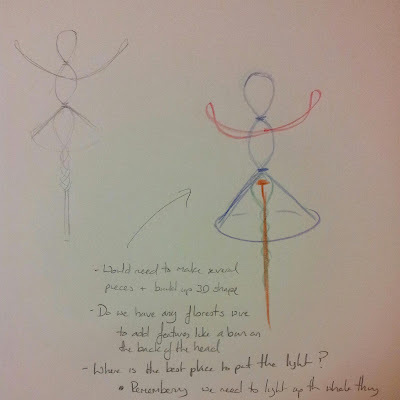 At home, M got straight to work designing her lantern and decided we should make a ballerina. Several drawings later and M had her design concept, which I converted into a wicker outline. Saturday M had her usual dance class, and after lunch we got on with the serious business of lantern making. I say 'we' in the genuine sense as even though technically I'd disappeared upstairs to make a start on Christmas wrapping, I kept popping down and helping. Dave had the task of securing the withies into a suitable frame following our design. Garden wire was used to form a bun on the back of the ballerina's head. I showed M how to apply PVA/water (in a 50:50) solution to the wet strength tissue and Dave wrapped it around the frame. 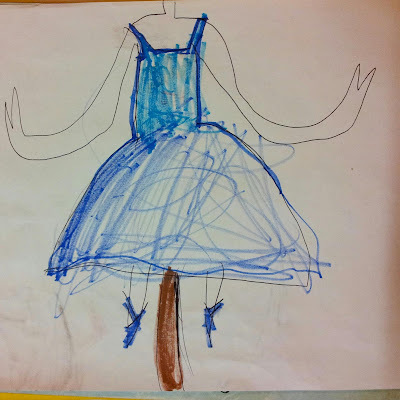 Once we had two layers of wet strength tissue, it was time to bring the ballerina to life with layers of normal coloured tissue paper. Anyone who has ever worked with normal tissue, will tell you this stuff is very delicate and prone to disintegrating when wet. I showed Dave and M how to cut the tissue paper into strips, apply glue to one strip at a time before gently adding to the ballerina. Sponge brushes are essential for this task and I think this was the most nerve wracking part of the construction process. Dave and M worked all afternoon and well into the evening, with my help as needed. The torch was attached to a toilet paper tube in the ballerina's middle and we decided to tape some electric tea lights under her tutu, to give a little extra glow. Dave applied large glitter flakes to the skirt and a bit of ribbon completed the waistband. The ballerina lantern in my kitchen. The ballerina was still drying on Sunday morning as we did our best to manoeuvre around her in the kitchen and the glue was barely dry when I put her in the car to drive to Leamington. This is what I call cutting it fine! And here she is, with M standing beside her for scale. We made our way to the meeting point for the Lantern Parade at the band stand in Leamington Spa's Royal Pump Room Gardens, joining over two and a half thousand other participants. Christmas songs played and a festive atmosphere filled the park as we waited for the nod to form up to walk through the town. Finally we began to move, slowly and in procession, we assumed a position towards the middle of the column as it formed up. At the point we crossed the road to leave the park, I looked back to see lanterns still snaking across the gardens behind us all the way over to the Pump Room. There were a lot of lanterneers. Our ballerina lantern, lit up and sparkling. And a longer one here, showing everyone walking past, but unfortunately we are barely noticeable as we're hiding behind a giant star. Finally, taking it in turns to carry our ballerina, we walked up the hill, around a corner and back down, past market traders and the people of Leamington who had gathered to watch. 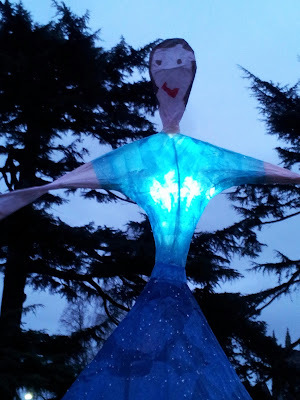 I saw several people point at our lantern and correctly identify her as a ballerina, which was very satisfying. At the Town Hall, we made our way to the shelter of the Christmas tree to join in the carolling, before returning slowly to the car. So ended our first Lantern Parade, which was a fun but mad scramble to put together a suitable lantern so we could join in. Next year, we need to start our construction phase a couple of weeks earlier! Brilliant lantern, event looks fun.